You have a few options when filtering widgets to only show the exact data you want in your dashboard. These options include filtering by network, naming convention, or performance metric. The first way to filter a Report is by selecting the exact entities you would like to use. This option is available for Cross-Network Widgets. Open up the edit widget modal and select the entity level you'd like to use in the From The Following dropdown. Once you select the entity level a new field will populate below. Select all of the different entities you would like included. In the example below, I selected the entity Campaigns. From there, you can see the drop-down to select the exact campaigns to be included. Note: If you leave the accounts/campaigns/ad groups/ads field blank all of the accounts/campaigns etc will be included. From there, you can use the Filter tab to further filter. The second filtering option is through the Filter tab in the edit widget modal. This option is available for Cross-Network Widgets and Direct Widgets. The first option in the Filter tab is to choose one or many accounts from the Account drop-down. Remember to search to find the exact account you are looking for. 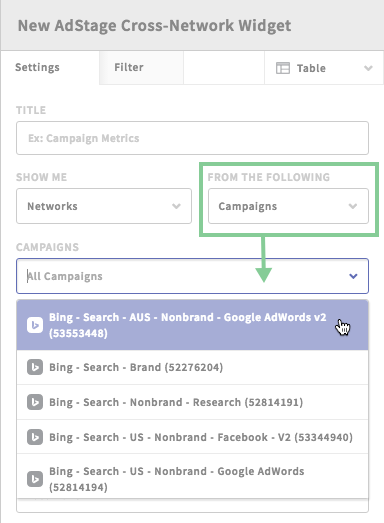 Secondly, you can use name filters to filter your results by account name, account ID, campaign name, campaign ID, ad group name, ad group ID, ad name, ad ID, and even ad attributes like headline or URL. For example, only show ad sets with "UK" in the Ad Group name. 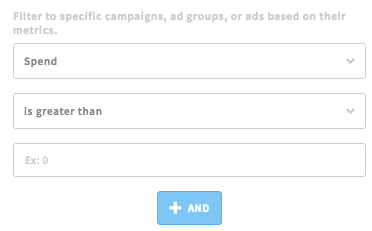 TIP: In this filter you can also filter by Campaign Type or Objective depending on the network. Thirdly, you can use a performance metric to filter the widget by. For example, only show campaigns where Spend > $0. Note: When you add multiple filters, it uses the AND property, meaning the entities will have to match both parameters. 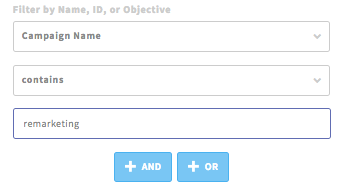 The OR property can only be used when filtering by name, ID, or objective. The methods above cover filtering at the widget level, but we also have an option to filter at the dashboard level. If you set default data sources at the dashboard level, every new cross-network widget you create will automatically use the selected entities. From there you can filter a widget to override the dashboard level data source. Learn more about Dashboard Default Data Sources.